One of the great cycling pleasures of living in Düsseldorf is the opportunity to participate in the monthly Klassikerausfahrtgruppe (catchy name!) ride, which takes place on the first Sunday of the month. It unites an interesting gang of riders who are joined by their interest in lightweight steel racing bicycles, although more modern bikes are present from time to time. Some great rides have taken place, including one in Holland, but most are local 2-3 hours rides around Düsseldorf. Although it is conceivable that no group on racing bikes has ever been so slow or so disorganized, we always manage to find our way back to the start at Ricci-Sport, perhaps lured on by the post-ride cake and coffee (which mirrors the pre-ride cake and coffee). There are generally no crashes, just a few flats, and always great camaraderie. Yesterday's ride was the final official one for the season and I had special permission from houseguests to go out. Timing has been an issue for me so this was only my third group ride (the others have been written up here and here). However, many familiar faces were there with not only some old bikes but even some different old bikes. As this was the last ride and we were going to be photographed, we had been instructed to bring out the best in order to impress the locals as we rode through town. It was finally time for me to take down the SBDU Raleigh off the wall stand, pump up the tires and ride it for the first time in Germany, and only the fifth time since its restoration in early 2010. Since it was very humid, I decided to leave my wool Raleigh jersey at home and went with the old-style maple leaf one. By the time I arrived at Ricci-Sport at 10:30 a great big group had already assembled and was working on the cake and/or admiring and comparing bicycles. It was clearly Rickert day as the made-in-Dortmund marque was represented by no fewer than four bikes, with two matching yellow ones from the early 1960s, a beautiful fully-chromed bike and an excellent blue one, the latter brought by Hartmut Snoek, who had come all the way from Münster. I met Hartmut last Sunday at an RTF ride in Essen, when he admired my Marinoni and I admired his Rickert. He is a serious collector of the brand, with around a dozen, including frames. There were a lot of interesting bicycles. 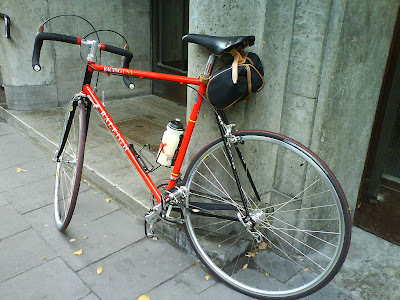 A Dutch cyclist had come with his Benotto and matching wool jersey (and white tires!). Conrad had a very fine Dutch RIH and a lady was riding a child-sized Colnago. Klaus had one of the yellow Rickerts instead of his usual Bottechia and there were Gazelles, and Koga Miyatas and a lovely blue/white Eddy Merckx, along with some makes unfamiliar to me. As we prepared to ride out we were joined (with exceptionally loud brake squealing) by Richard of Ricci-Sports, who is a usual participant on these rides but broke his leg badly in July during a race in the Netherlands. He is down to one crutch instead of two now and managed to ride to the shop from home yesterday, which must have been a challenge. He brought out the second yellow Rickert and rode a block with us before turning back. The weather has been unsettled and while it had been beautiful and hot on Saturday, the forecast was not so great. But we all started in great spirits, and in the usual semi-random disorder. We rode through the area near my apartment and then through the Grafenberger Wald. It was here at 6.5 kms I discovered that bikes that have not been ridden for a year should be checked out more carefully as my Campagnolo shifter went into "auto" mode: that is, once I shifted down at the base of a hill, the bike decided on its own to shift all the way back up five gears to the hardest gear. I had to get off, shift onto a smaller cog and firmly tighten the shift lever, something I had learned to do on my first test ride last year. I was the last one up the hill but had no further shifting issues for the rest of the day. There were a few other hills to climb but the roads, many of which I have ridden before, were excellent and quiet on Sunday morning. We stop at the top of hills to regroup and things were going nicely when we looked to the north and saw some very very dark clouds, and heard some thunder. Someone cheerfully pointed out that the wind was blowing the clouds away from us. 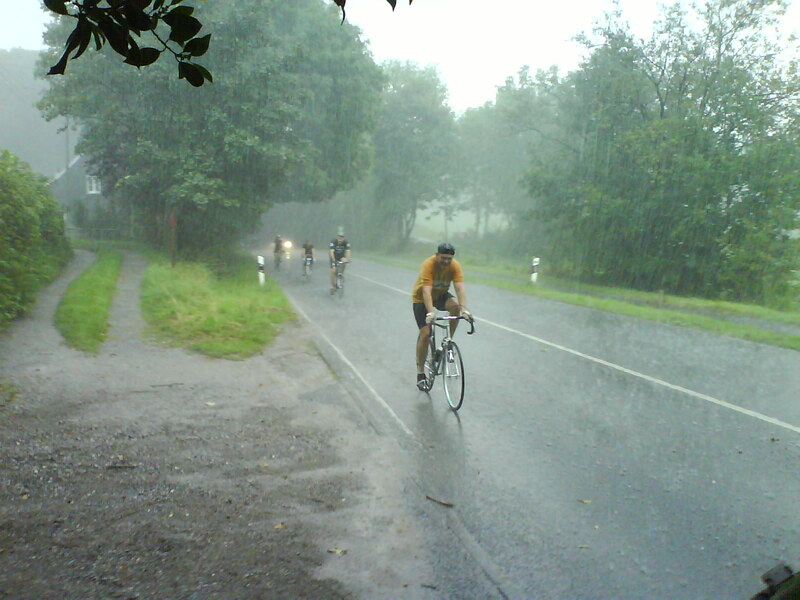 This may have been true at that point but once we were into Essen-Kettwig and about to begin the nice climb called "the Esel" (the Donkey), the skies opened up and the rain poured down. At this point we were about to turn left past a Greek restaurant on Essener Strasse. It had an outdoor terrace with umbrellas and we zoomed into it and stood there while the rain came down in buckets. It was good timing as well for Karsten, who had the Usual Flat Tire of the trip. Most of us had left our bikes on a stand out front but two or three were standing with their bikes under the umbrellas, much to the dissatisfaction of the owner. I would have thought that with 20 or so cyclists totally captive by the rain, it would have been a good occasion to rev up the coffee machine or bring out the apfelschorle and make some profit but he was clearly anxious to get rid of us. We obliged as soon as the rain let up and began the climb up the hill. I first rode the Esel last Sunday during the Essen RTF ride and really liked it. It is not extremely steep and has three nice switchbacks. The shifting on the Raleigh was working perfectly now and I could accelerate quite nicely up to the top. I was with a small group and then came the sucker punch as the rain suddenly began again in earnest. We pulled over to stand under the trees but it was pretty pointless as after a few moments we were soaking wet. Once the rain let up again we were back on the road, looking like soaked rats. Klaus complained that his wool jersey soaked up water like a sponge and some of the other riders noted that their old-fashioned shoes did not have drain holes. Someone suggested that as a result of this ride my Raleigh would be worth half as much as it had been at the start but our spirits rose as the sun came out and we began to dry off in the warm wind. It was also obvious that on the short hills some of the oldie bicycles were not equipped with modern gearing for climbing as some of the oldie riders had to work heroically to get up them. At least I was able to use my toe clips and straps fairly effectively by the end of the ride. They are essential for the retro-look but clipless pedals are far, far better! We passed through the woods around Oberdorf and soon rejoined our outward-bound route, taking us through Ratingen and back to Düsseldorf, Grünerstrasse and Ricci-Sports. There was lots of coffee and really, really excellent cake to balance any of the calorie-burning effects of our 44.34 km ride, with just under 400 m of climbing. Our 2:02 time of actual riding was pretty much matched by the amount of time it took me to clean all the grit off of the Raleigh today. And before people left, there was an opportunity to have your photo taken with your bike, using a large blue dumpster as a backdrop, which might perhaps be seen by many in the modern cycling community as appropriate given what we ride. A group of the riders will go back to Holland on October 18 to ride with some of the Dutch steel lightweight enthusiasts but unfortunately I will be unable to join them. Many of the Düsseldorf group will be in Tuscany for l'Eroica so I look forward to exchanging coffee for Chianti with them then!